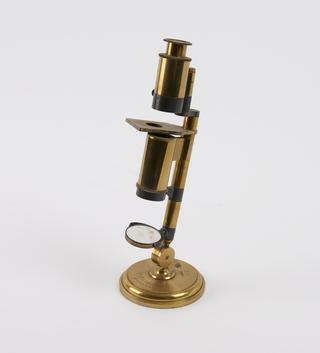 Demonstration polariscope, rosewood and ivory frame and handle a with rotating mount containing six mineral crystals samples and oval red leather and wood case with velvet and silk lining, unsigned, British, 1830-1880. Once the property of Sylvanus P Thompson (1851-1916), professor of physics at the City and Guilds Technical College in Finsbury, England. Demonstration polariscope with red leather case. Lantern polariscope. L-shaped brass and iron tube with multiple glass plate polarisor. Spring clamp for slide holding. Rack and pinion for focussing lens. Eyepiece attachment for analysing prism (missing. Early Arago Polariscope, in case, French, c1870. [stack of glass plates in brass frame] For measuring intensity of polarized light. Polariscope in case, made by Newton & Co. Ltd, London. Brass demonstration polariscope with biaxial crystal (calcite? ), unsigned, British, 1830-1880. Once the property of Sylvanus P Thompson (1851-1916), professor of physics at the City and Guilds Technical College in Finsbury, England. Polariscope with tourmalines etc, on stand, three levelling screws. 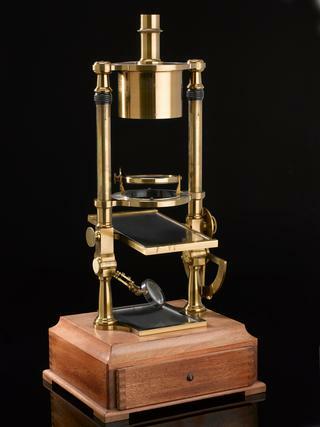 The polariscope is a form of Wheatstone's Polar Clock, Hour Circle, 0 degree to 360 degrees in 1 degree vertical circle, 0 degree to 90 degrees in 1 degrees, by vernier to 5' two spirit levels fixed in base plate, Nicol eye piece with hour dial, Nicol and two circles adjusted by screw. In box, and with three legs in another box. 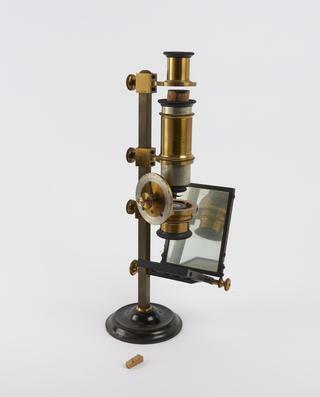 Polariscope and accessories, (polari-microscope) in case with key, made by J. G. Hofmann, Paris (damaged). 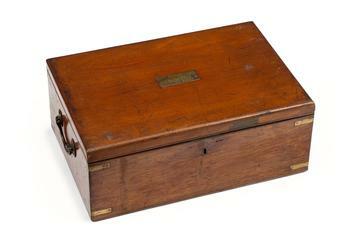 Polariscope by Harvey & Peak, successors to W. Ladd & Co., Beak St., London, In incomplete wooden case (case front missing), instrument signed. 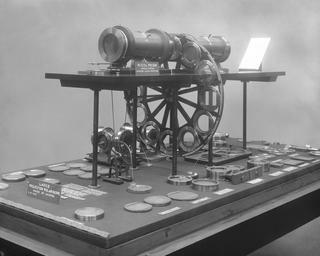 Groth's universal apparatus:- vertical polariscope with arrangements for parallel and convergent light, in two boxes, etc.